LivingWell Nutraceuticals Rub On Relief Review | Does It Work? LivingWell Nutraceuticals Rub On Relief Review – Is This Product Safe To Use? 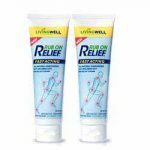 Topical analgesic is the primary product we use whenever we want fast and effective pain relief, LivingWell Nutraceuticals has a product called Rub On Relief that claims to offer these benefits. What is LivingWell Nutraceuticals Rub On Relief? What is the Company Behind LivingWell Nutraceuticals Rub On Relief? 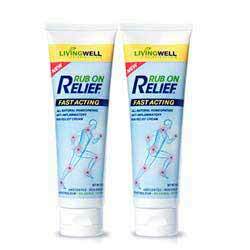 What are the Ingredients Used in LivingWell Nutraceuticals Rub On Relief? How LivingWell Nutraceuticals Rub On Relief Works? What are the Pros of LivingWell Nutraceuticals Rub On Relief? What are the Cons of LivingWell Nutraceuticals Rub On Relief? What are the potential Side Effects of using LivingWell Nutraceuticals Rub On Relief? The manufacturer of this topical analgesic is LivingWell Nutraceuticals. Menthol – It acts as a counterirritant that stimulates the thermoreceptors in the skin to divert the attention away from the pain. When applied topically, menthol ligands attach to the kappa opioid receptors which cause a numbing effect on the affected area. Rhus Tox – This is sourced from Poison Ivy. It is commonly used as an herbal remedy for muscle spasms, sprains, strains, and joint stiffness. Belladona – It is an herbal ingredient that has been used for treating pain associated with rheumatism. It also reduces joint pain and inflammation. However, its safety as an herbal remedy has not been established. Magnesium Sulfate – It is an important compound in the body that is needed to relax muscle spasms. Phosphorus – It helps to reduce muscle and joint pain after a strenuous activity. It is also needed for the repair of damaged cells in the body mainly in the bones, muscles, and joints. It also helps regulate the balance and use of important vitamins and minerals in the body. Ignatia – It calms the nerves and improves circulation of blood in the body. Lachesis Mutus – This homeopathic ingredient is sourced from the poisonous venom of the bushmaster snake. It is believed to improve mood and reduce anxiety. Naja – This ingredient is sourced from the venom of cobra. It is believed to reduce inflammation and pain of tissue nerves. MSM – Methylsulfonylmethane is a naturally occurring sulphur compound in the body that is known to reduce joint pain and inflammation. Cetyl Myristoleate – According to studies, it reduces joints pain, inflammation, and swelling. It also improves joint flexibility and mobility. It helps enhance synovial fluid production to act as the cushion between joints in order to protect them from frictional damage. LivingWell Nutraceuticals Rub On Relief primarily works by the process of counterirritation through the use of menthol. Since it has a numbing effect on the body, the pain sensation is greatly reduced. This mode of action is synergistically enhanced through the use of other herbal components that have been believed to also reduce joint pain, inflammation, and swelling. It does not have strong scent. It only has a light mint smell. It is easily absorbed through the skin and does not leave a greasy feel. It is said that the effects can be experienced quick and they are long lasting. It has a money back guarantee for unsatisfied consumers. It contains herbal ingredients that when absorbed systemically can cause adverse reactions like poisoning and bleeding. It also contains venom from snakes which are neuro-toxic and can cause certain complications, especially when absorbed in the systemic circulation. Apply a liberal amount of the product on the affected area and massage thoroughly. This can be repeated 3-4 times in a day. There was no published research to attest to the product’s effectiveness and safety. The product might contain menthol however its percentage is not that high as compared to other topical analgesics thus providing less pain relieving benefit. While it is true that it contains other supplementary herbal ingredients to relieve joint pain, they are not scientifically proven to be safe and effective. If you are constantly experiencing joint pain and inflammation, this product might not be the right one for you because its safety and efficacy have not been subjected to any research or clinical trial. What Should I Expect When Using Rub On Relief? According to the manufacturer, pain relief, enhanced flexibility, and mobility can be expected when using this product. It might cause a cool sensation upon application on the affected area. Will Rub On Relief Show Results? The product might have provided some benefits to other people but it is not suitable and effective for everyone. It might temporarily reduce joint pain but it will not address why the pain is occurring which is commonly due to joint and cartilage damage. According to the manufacturer, pain relief can be noticed after several hours of applying the product. This product is for topical and external use only. Do not apply the product over broken or wounded skin because it might cause the ingredients to be systemically absorbed. Do not apply heating pads over the affected area because the numbing effect of the product might cause burn injuries. If you are looking for quick, effective, and safe topical pain relievers, LivingWell Nutraceuticals Rub On Relief might not be a good option because its safety is the priority concern. It contains ingredients which safety for human use is questionable. Its menthol component is also less as compared to other topical analgesics. Lastly, it does not contain ingredients that support optimum joint health. I walk around in my job for 5 hours! This has helped me get thru the first month! I built up my muscles now, so I do not need it as often because it heals! I will keep on hand and I highly recommend to all. They have other great products. Again, it is natural, and NOT Poisonous!